The delay in this post, as I continue to search the Sermon on the Mount, to try to reach into the depths of Jesus heart as he spoke, comes because after reading the passage, after considering his words, after Pausing and Pondering, which are the purposes of this blog, I sensed that while specific to marriage, the intent extended beyond the marriage bed. Or even the marriage head, since Jesus pointed out to have lust for another constituted the act of adultery. And then the talk of cutting off offending body parts, an image not easily digested and I fear used by some to uphold body mutilation, leaves me a bit baffled. Over and over in the Old Testament, God addresses Israel as an adulterous bride. Over and over again, He allows them to prostitute themselves before other gods…to chase after a King…to take the slippery slope to destruction. He did not let them do this without sending prophets to warn them or captors to carry them into foreign lands. But always He brought them back, forgave them, redeemed them and enabled them to rebuild. Somehow in the 400 years between the Old and New Testaments, they finally got the ONE GOD concept, so when Jesus came the Hebrew people worshipped God, at least in all outward ways. They also got the one man/one woman concept of marriage, although they had built in a few loop holes. No longer were men polygamous in the Jewish culture of Jesus day. However, when Jesus came the God worshipped by the most “religious” was synonymous with the Law…with all its man driven interpretations and explanations. And while Jesus has just said he did not come to destroy but fulfill the law, Jesus has come to reveal in his fulfillment the heart of the law and the key is FAITHFULNESS. Marriage on earth represents our marriage as the Bride of Christ (the Church) to Jesus, God the Son. Even before Jesus God the Father considered Israel His bride. Jesus tells parables about faithfulness and leaves us with the thought that faithfulness in small things precedes faithfulness in large things. Jesus knows that faithfulness demands a choice, not a one time choice, but a day by day inventory of our thoughts and inclinations. It requires commitment in every single corner of our lives…Faithfulness to God, Faithfulness to our spouse are a whole lot more natural if we practice faithfulness and promise keeping in every situation. Will we fail? Yes, probably, but that is where Jesus words about the hand and the eye gory as that is come into play. 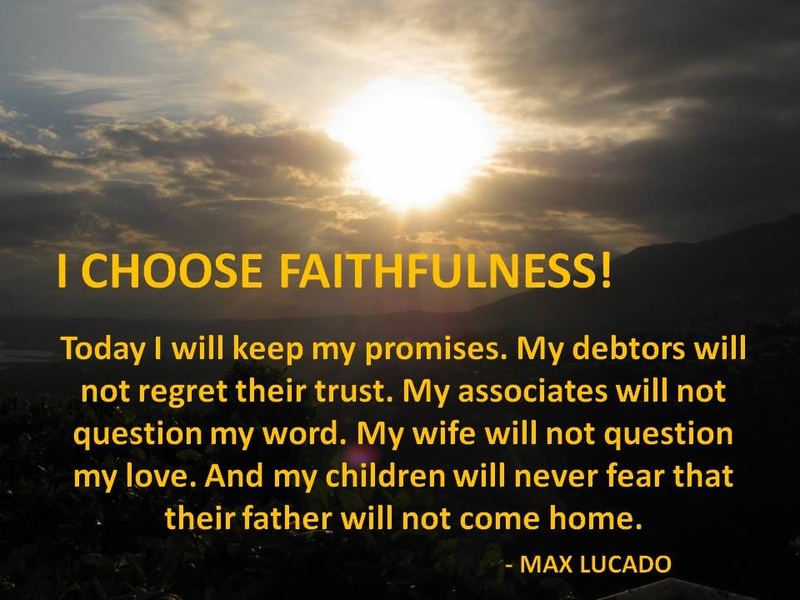 What tempts me to not be faithful? That too requires a day to day inventory and purposeful abandonment of the Faithfulness Toxins. As I said this one was a hard one to wrap my heart and mind around. It required soul searching. I love God, but I run after other stuff and care too much about the opinion of others. I love my husband but I bury myself in a book or with my IPad when I could be spending time with him. Let’s face it! I fall short of the TARGET! BUT the GOOD NEWS is: God doesn’t quit being faithful to me. He lets me come running back time after time.